A nationally-rated chess championship named "Kejohanan Catur Terbuka KUSESS 2014" or KUSESS Open Chess Championship in English will be held this coming weekend at Sekolah Menengah Sains Kuala Selangor. About 130 teams and 450 chess players have registered for the championship for two different events and categories. The events are school Team Open and Individual Rapid while the categories are Under 18 or Secondary School and Under 12 or Primary School. For more info and details, go to http://kusesschessopen.blogspot.com/ blog. 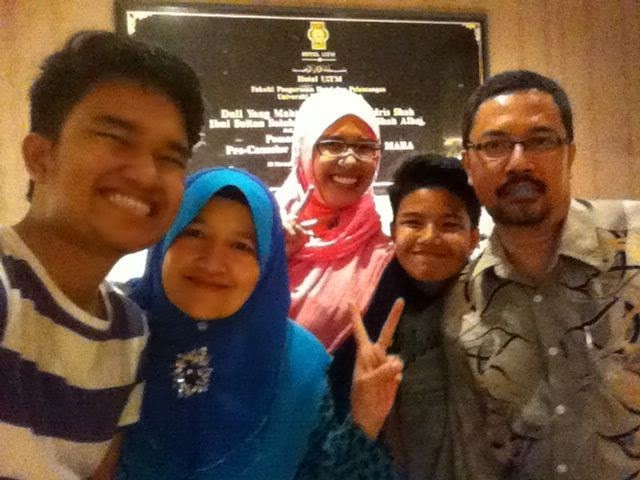 Below is a selfie picture taken by GiLoCatur's eldest child, Fikri, using his smart phone on Saturday, 3rd May 2014. The venue where the picture was taken is the lobby of UiTM Shah Alam Hotel. The occasion is birthday celebration dinner of GiLoCatur's only daughter, Anis Fariha. GiLoCatur just realized and remembered that actually GiLoCatur had taken a selfie picture a decade ago. Where GiLoCatur took the selfie photo? Believe it or not, it was in Sydney in March 2004 when GiLoCatur was going outstation overseas. Since GiLoCatur was outstation to Sydney alone, GiLoCatur had to take photos by own self. What camera did GiLoCatur use? Sony Mavica. Why this entry is titled "Cinco de Mayo"? "Cinco de Mayo" is a Spanish language. It means fifth of May. Anis was born on fifth of May sixteen years ago in Shah Alam. Thus, "Cinco de Mayo" is the birth date of Anis. Since this year it falls on Monday, GiLoCatur and family have to celebrate it early for Anis which is on Saturday, 3rd of May. my beloved daughter ANIS FARIHA! How time flies. Look at below pictures. 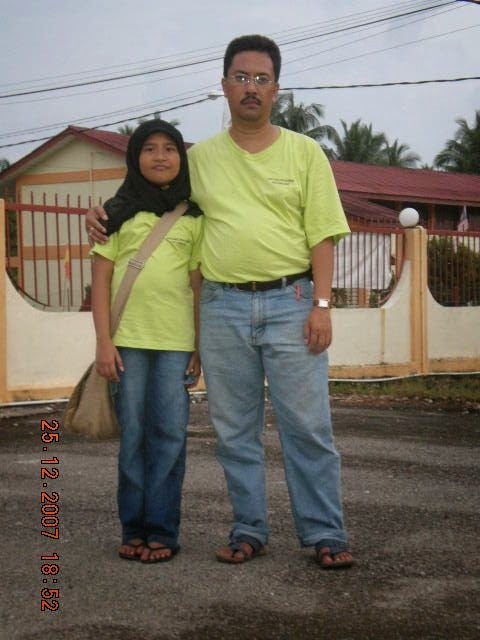 One was taken in 2007 when Anis was 9 years old. The other was taken this year, 2014, after seven years.